Ask A Vet: What's the Best Dog Food for Arthritis and Joint Health? Home Dog Food Ask a Vet: What’s the Best Dog Food for Arthritis? As dogs age, their health deteriorates, and the most common health problem in senior dogs is osteoarthritis (1). Unfortunately, canine arthritis is not exclusive to geriatric dogs, and younger adult dogs may also suffer from this problem as well (2, 3, 4). A dietary change for arthritic dogs is key to alleviating the symptoms, so what's the best dog food for arthritis and how to pick one? In this article, we'll cover the causes, prevention and treatment of canine arthritis through dietary means, and I will review the best dog food for arthritis brands as well as other methods pet owners can use to alleviate the discomfort and pain in dogs with this condition. Therapeutic diets are actually much older than you might think. Diet was very important in Eastern medicine for maintaining good health, balancing the body and treating disease. Traditional Chinese Medicine classifies different foods based on how they affect the body, if they are “cooling” or “warming” and how they affect the yin and yang balance. Many of these practices are thousands of years old, and some supported by studies. Diet therapy for illnesses like canine arthritis has been a common part of veterinary medicine for decades, but only in recent years more brands have started investing in research towards the best dog food for arthritis to help with the disease. The first commercially available “therapeutic diet” for dogs in the United States was pioneered by Dr. Mark Morris, Sr. in 1939. He was asked by a blind man to help his guide dog who was suffering from kidney disease. Dr. Morris believed that medical conditions could be managed through diet, and he formulated the very first “kidney diet” for this lucky dog. His formula is now known as Hill’s Science Diet k/d and is still sold today. This and their other dog food formulas have been clinically proven to help improve health problems in dogs and cats, including aging related diseases and cognitive decline (5). Dr. Morris is the founder of Hill's Pet Nutrition and has become a visionary in the field of clinical nutrition for pets. Veterinarians usually pick Hill's Science as one of their most vet recommended dog food brands for this and many other reasons, no least of which is the fact that the company spends the most funds on advancing veterinary research and diet-related approaches. Today, pets are living longer, healthier lives than ever thanks to improvements in living conditions, veterinary medical care and optimized commercial dog food diets. However, with a longer lifespan comes certain age-related diseases, such as osteoarthritis in dogs. Canine arthritis, or osteoarthritis, can happen to dogs of all ages, but is most common in older or geriatric patients. Before we discuss the best dog food for arthritis, let’s take a closer look at the disease itself and what it means for the dog. What's the Best Dog Food for Arthritis? Just like in humans, joints serve the same purpose in dogs. Joints are where bones meet each other and are the “hinges” that help facilitate movement. Bones are made up of very hard minerals, but also contain a blood and nerve supply. The surface of a bone is very sensitive and is covered by a substance called cartilage, where it meets another bone in the joint. There are many different types of joints in the body, but most involve cartilage in one way or another. Cartilage is a “buffer” that protects the bones as they rub against each other with every movement. It is a living substance, made up of cells that produce lubrication and cushioning for the dog's joints. There are many reasons for why a dog may suffer from arthritis (6, 7, 8, 9). Aging, breed, diet, exercise, infections, stress and much more will affect and relate to the dog's joints and their condition in one way or another. Over time, cartilage can become damaged or diseased. When this happens, it doesn’t function as well, leading to inflammation and painful bone-on-bone contact. Trauma, infection, auto-immune disease, congenital defects and abnormal limb structure (such as poor conformation in Dachshunds) can all cause cartilage damage and arthritis. Canine osteoarthritis is one of the most common causes of pain and discomfort for dogs of any age and breed (10, 11). It affects dogs' mental and physical condition in different ways, and aside from pain, causes these dogs to become more sedentary (12, 13, 14, 15). Nutrition is the cornerstone of good health, regardless of what disease process you wish to prevent or treat in your dog. Food therapy has been proven to be an important part in treating and preventing arthritis in dogs, as long as specific formulation for arthritic dogs is used, such as one of the below mentioned best dog food for arthritis brands or home diets (16). Studies have shown over and over again how nutrition and proper dog food for dogs with arthritis can help with this condition (17, 18). While well-balanced dog food diets are the go-to source, some specific food items have also been shown to alleviate arthritis symptoms in dogs (19, 20, 21, 22) with pet food manufacturers later adding these food items into their best dog food for arthritis products. Further research also showed how addition of nutraceuticals (23) and supplements such as fish oil for dogs can significantly improve the condition of arthritic dogs through reduction of inflammation, which applies to aging senior dogs and younger adult dogs alike (24, 25, 26). Almost every best dog food for arthritis product now contains omega-3s in large quantities in them. FDA has also released a guide (PDF) for the industry to follow in order to assist dogs with arthritis and manufacture the best dog food for arthritis products to address this specific health problem. It is important to be in contact with your dog’s veterinarian about his or her mobility issues and formulate a plan together that will be most beneficial, and address the specific health problems in your dog. This will include anything from specific best dog food for arthritis, joint supplements, care, exercise routine, precautions and more. Many patients require more than one therapy to reduce pain and improve mobility of arthritic dogs. While the science-based method is normally recommended, consulting with a holistic veterinarian is also a good option if one is available in your area to get a second opinion and further develop your plan on dealing with an arthritic dog. See your veterinarian regularly, especially if your dog injures himself, seems to have muscle, joint or back pain. Reducing inflammation quickly can help prevent further cartilage damage and early onset of arthritis. Alos, provide appropriate preventative care every 6-12 months, depending on your dog’s life stage. Use flea and tick preventatives – if you live in an area with a lot of ticks, tick-borne diseases such as Ehrlichiosis and Lyme Disease can cause swollen joints, cartilage damage and arthritis. If your dog already has arthritis, don’t despair. Treatment for this disease can encompass a wide variety of methods, starting with the best dog food for arthritis and further adjusting his diet, lifestyle and treatments as per your vet's guidance. On top of that, you can also include pain medication for dogs with arthritis (NSAIDs and narcotics), supplementation, acupuncture, herbal therapy, massage therapy, physical therapy, cold laser therapy and diet therapy. Although not all of them have been proven to work, some dog owners have anecdotal evidence that they do. As noted in the above studies, diet is critical to treating your pet's arthritis condition. Not only can the proper diet and specific best dog food for arthritis help aid in joint mobility and function, it can also provide relief for the aches and pains associated with arthritis. Additional supplementation of GAGs may be necessary, as your dog may not get the proper “dose” of them every day with every meal from commercial diets. And even though some of the best dog food for arthritis brands may contain them, it will depend on your specific pet whether he or she requires more. Furthermore, some ill dogs eat less some days than others. The company that pioneered commercial diet therapy offers a prescription food through your veterinarian, many ‘big-box’ pet stores and Amazon. It contains high levels of essential fatty acids, antioxidants, and natural sources of glucosamine and chondroitin sulfate. Not the most popular but arguably the best dog food for arthritis brand out there, this recipe may be most appropriate as an adjunctive therapy for dogs with moderate to severe arthritis. Owners could see improvement in mobility in as little as 21 days and I have personally seen my patients' improvements. This diet does not require a prescription and is pretty much the same as j/d I've mentioned above, except it does not contain as many essential fatty acids. This is why it's also less expensive than j/d. This is one of the best dog food for arthritis of mild to moderate cases, and owners may see improvement in mobility in just 30 days. Veterinarians generally like the Hill's Science diet due to their proven methodology and testing of their diets to ensure how it addresses illnesses in dogs. This is not my first choice, but as an alternative to the above, you can also discuss Diet Metabolic+Mobility with your veterinarian. The reason this one is among the best dog food for arthritis brands is because the diet helps overweight and obese dogs lose weight, which subsequently helps to alleviate joint associated pain. The ingredients may also support the dog's joint health. If fed properly, it may improve mobility in as little as 21 days and help your dog lose 13% of his body weight in just 60 days, according to the manufacturer but not observed in studies yet. This over-the-counter brand contains a variety of antioxidants, essential fatty acids and glucosamine for joint support. It's a similar equivalent to Hill's option and may be the best dog food for arthritis brand for pets in various arthritis stages. This diet is also formulated with an adapted fiber content and highly digestible proteins to foster proper digestion. These above four mentioned best dog food for arthritis products have been fairly popular and effective among veterinarians and their patients, but your own veterinarian may recommend a different one, and it's absolutely crucial that you discuss this with your vet before purchasing and feeding any of these brands. 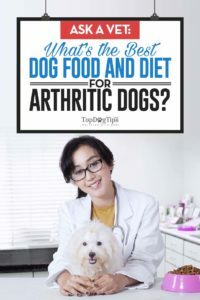 Make sure to research the next diet you buy for your arthritic dog to ensure that there's some evidence on how and why it works, and read dog food reviews from other pet owners to further confirm it. While myself and most other vets I know will usually recommend finding the best dog food for arthritis brand available commercially, a DIY is still a viable option. That said, there are many things for pet owners to consider before using homemade dog food diets and it's not as simple as throwing a bunch of leftovers in a pot. Understanding homemade dog food cooking is especially important if it's for a dog with arthritis, as there are certain dangers associated with a DIY home foods. Homemade diet and holistic veterinary medicine in general can be tricky, but there's anecdotal evidence from pet owners claiming that it works. Homemade diets for dogs with arthritis can be tailor-made by a veterinary nutritionist or holistic veterinary practitioner. If these diets are not balanced, your dog’s overall health may be compromised, so stick to a reputable recipe and discuss it with a vet. Many of these recipes provide a basis of balanced nutrition but add in whole-food sources of antioxidants, essential fatty acids and GAGs. Combinations for diets can include shellfish, salmon, blueberries, kale, pumpkin and sweet potato. 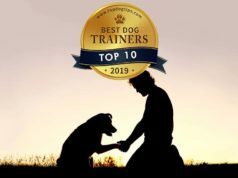 In my opinion, the best homemade diet for an arthritic dog is formulated by a holistic veterinarian that practices Traditional Chinese Veterinary Medicine (TCVM). In humans, Traditional Chinese medicine employs bone and tendon broths to help ease arthritis pain. This is also a very ‘whole-foods’ approach to the treatment, as many GAGs (like chondroitin sulfate and glucosamine) are released into the broth when bones and connective tissues are boiled. Some of these broths can help dogs with arthritis, but sometimes the “dose” is too dilute. Overall, majority of veterinarians will recommend sticking with science-based approach and using commercially available best dog food for arthritis brands that have been tested in studies as opposed to home diet that has little research behind it. Holistic and DIY cooking approaches can be helpful in addition to an evidence-based approach to treat arthritis in dogs as long as it's monitored by your veterinarian. Martinez SA1. Congenital conditions that lead to osteoarthritis in the dog. Vet Clin North Am Small Anim Pract. 1997 Jul;27(4):735-58. Pettitt RA, German AJ. Investigation and management of canine osteoarthritis. In Practice 2015;37:1-8. Martinez SA1, Coronado GS. Acquired conditions that lead to osteoarthritis in the dog. Vet Clin North Am Small Anim Pract. 1997 Jul;27(4):759-75. Liu W1, Burton-Wurster N, Glant TT, Tashman S, Sumner DR, Kamath RV, Lust G, Kimura JH, Cs-Szabo G. Spontaneous and experimental osteoarthritis in dog: similarities and differences in proteoglycan levels. J Orthop Res. 2003 Jul;21(4):730-7. Hegemann N1, Kohn B, Brunnberg L, Schmidt MF. Biomarkers of joint tissue metabolism in canine osteoarthritic and arthritic joint disorders. Osteoarthritis Cartilage. 2002 Sep;10(9):714-21. Sbrana S1, Marchetti V, Mancianti F, Guidi G, Bennett D. Retrospective study of 14 cases of canine arthritis secondary to Leishmania infection. J Small Anim Pract. 2014 Jun;55(6):309-13. doi: 10.1111/jsap.12204. Epub 2014 Apr 3. Vaughan-Scott T1, Taylor JH. The pathophysiology and medical management of canine osteoarthritis. J S Afr Vet Assoc. 1997 Mar;68(1):21-5. Hielm-Björkman AK1, Rita H, Tulamo RM. Psychometric testing of the Helsinki chronic pain index by completion of a questionnaire in Finnish by owners of dogs with chronic signs of pain caused by osteoarthritis. Am J Vet Res. 2009 Jun;70(6):727-34. doi: 10.2460/ajvr.70.6.727. Hansen BD1, Lascelles BD, Keene BW, Adams AK, Thomson AE. Evaluation of an accelerometer for at-home monitoring of spontaneous activity in dogs. Am J Vet Res. 2007 May;68(5):468-75. Wernham BG1, Trumpatori B, Hash J, Lipsett J, Davidson G, Wackerow P, Thomson A, Lascelles BD. Dose reduction of meloxicam in dogs with osteoarthritis-associated pain and impaired mobility. J Vet Intern Med. 2011 Nov-Dec;25(6):1298-305. doi: 10.1111/j.1939-1676.2011.00825.x. Epub 2011 Nov 1. Hudson JT1, Slater MR, Taylor L, Scott HM, Kerwin SC. Assessing repeatability and validity of a visual analogue scale questionnaire for use in assessing pain and lameness in dogs. Am J Vet Res. 2004 Dec;65(12):1634-43. Hielm-Björkman AK1, Kuusela E, Liman A, Markkola A, Saarto E, Huttunen P, Leppäluoto J, Tulamo RM, Raekallio M. Evaluation of methods for assessment of pain associated with chronic osteoarthritis in dogs. J Am Vet Med Assoc. 2003 Jun 1;222(11):1552-8. Johnston SA1, McLaughlin RM, Budsberg SC. Nonsurgical management of osteoarthritis in dogs. Vet Clin North Am Small Anim Pract. 2008 Nov;38(6):1449-70, viii. doi: 10.1016/j.cvsm.2008.08.001. Budsberg SC1, Bartges JW. Nutrition and osteoarthritis in dogs: does it help? Vet Clin North Am Small Anim Pract. 2006 Nov;36(6):1307-23, vii. Rialland, P., Bichot, S., Lussier, B., Moreau, M., Beaudry, F., del Castillo, J. R., … Troncy, E. (2013). Effect of a diet enriched with green-lipped mussel on pain behavior and functioning in dogs with clinical osteoarthritis. Canadian Journal of Veterinary Research, 77(1), 66–74. Bui LM1, Bierer TL. Influence of green lipped mussels (Perna canaliculus) in alleviating signs of arthritis in dogs. Vet Ther. 2003 Winter;4(4):397-407. Innes JF1, Fuller CJ, Grover ER, Kelly AL, Burn JF. Randomised, double-blind, placebo-controlled parallel group study of P54FP for the treatment of dogs with osteoarthritis. Vet Rec. 2003 Apr 12;152(15):457-60. Bierer TL1, Bui LM. Improvement of arthritic signs in dogs fed green-lipped mussel (Perna canaliculus). J Nutr. 2002 Jun;132(6 Suppl 2):1634S-6S. Gingerich DA1, Strobel JD. Use of client-specific outcome measures to assess treatment effects in geriatric, arthritic dogs: controlled clinical evaluation of a nutraceutical. Vet Ther. 2003 Spring;4(1):56-66. Fritsch DA1, Allen TA, Dodd CE, Jewell DE, Sixby KA, Leventhal PS, Brejda J, Hahn KA. A multicenter study of the effect of dietary supplementation with fish oil omega-3 fatty acids on carprofen dosage in dogs with osteoarthritis. J Am Vet Med Assoc. 2010 Mar 1;236(5):535-9. doi: 10.2460/javma.236.5.535. D'Altilio M1, Peal A, Alvey M, Simms C, Curtsinger A, Gupta RC, Canerdy TD, Goad JT, Bagchi M, Bagchi D. Therapeutic Efficacy and Safety of Undenatured Type II Collagen Singly or in Combination with Glucosamine and Chondroitin in Arthritic Dogs. Toxicol Mech Methods. 2007;17(4):189-96. doi: 10.1080/15376510600910469. De Oliveira El-Warrak, A., Rouma, M., Amoroso, A., Boysen, S. R., & Chorfi, Y. (2012). Measurement of vitamin A, vitamin E, selenium, and L-lactate in dogs with and without osteoarthritis secondary to ruptured cranial cruciate ligament. The Canadian Veterinary Journal, 53(12), 1285–1288. Rhouma, M., de Oliveira El Warrak, A., Troncy, E., Beaudry, F., & Chorfi, Y. (2013). Anti-inflammatory response of dietary vitamin E and its effects on pain and joint structures during early stages of surgically induced osteoarthritis in dogs. Canadian Journal of Veterinary Research, 77(3), 191–198.